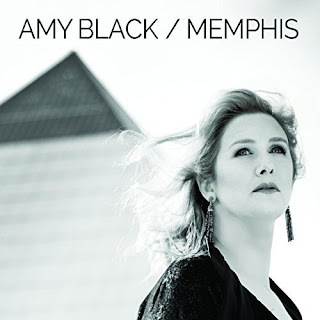 I just had the opportunity to review the most recent release, Memphis, from Amy Black and it's old school. Opening with It's Hard To Love An Angry Man, Black shows her serious nature backed by Al Gamble on Hammond, Leroy Flick Hodges on bass, George Sluppick on drums, and really nice guitar work by Joe Restivo. Mark Franklin on trumpet, Kirk Smothers on tenor sax, Art Edmaiston on bari sax really adds to the warmth and Reba Russell, Daunielle Hill and Black contribute super backing vocals. Out for a rumble on The Blackest Cloud Edmaiston's sax work really sets the track off and the horn section really adds punch. Ballad, Without You is a full taste of the reason this release is called Memphis (from my perspective) with upfront female vocals and solid horns. One of top radio tracks on the release, If I Could Reach Out (and Help Somebody) is a super smooth with R&B bones and strings (Jessie Munson on violin, Yennifer Correia on violin, Jennifer Puckett on viola and Jonathan Kirkscey on cello. I particularly like Black's lead vocals on Let The Light with a airy darkness and rich backing vocals, Rev Charles Hodges on Hammond and a bluesy guitar solo by Restivo. High steppin' What Makes A Man has that cool Al Green strut. Franklin's trumpet highlights and that super bari sax by Edmaiston really sets the track off. Sassy, Further On Up The Road, with terrific vocals by Black, top notch key work from Hodges, really punchy horn work and excellent guitar work from Restivo. Wrapping the release is classic blues track, I Need Your Love So Bad. Excellent lead vocals are the key with super Hammond work from Hodges and hot bluesy chops from Bobby Manuel on guitar making this a strong closer for a cool release.